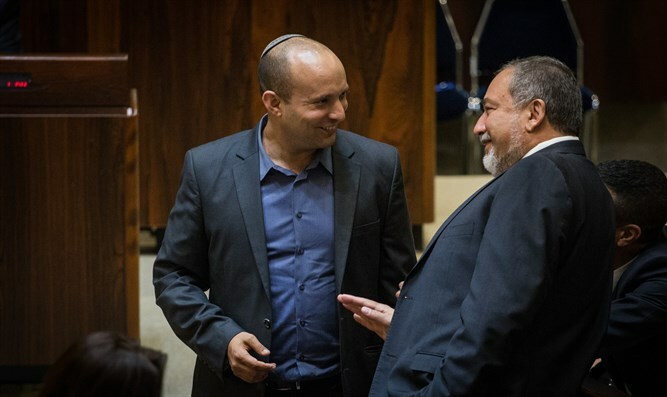 The dust-up between the Jewish Home party and senior defense officials continued on Monday, with party officials attacking Defense Minister Avigdor Liberman (Yisrael Beytenu), deriding him as “weak” and “confused”. The fracas began at a cabinet meeting Sunday, when a debate between Education Minister Naftali Bennett (Jewish Home) and IDF Chief of Staff Gadi Eizenkot became heated. Bennett had called upon the Chief of Staff to use force against Gaza terrorists launching balloons or kites laden with explosive or incendiary devices, a demand Eizenkot refused. Eizenkot replied that "I do not think that shooting boys and children who are the ones who launch the balloons and the kites is correct." Bennett then asked Eizenkot "what if we are talking about an adult who is identified as an adult?" "Are you proposing to drop a bomb from an airplane on a squadron of kite and balloon launchers?" asked Eizenkot. After Bennett answered in the affirmative, Eizenkot said that "this contradicts my operational and moral position." On Monday morning, Defense Minister Liberman attacked Bennett for his criticism of Eizenkot, calling Bennett’s comments Sunday “disgusting”. In response, the Jewish Home released a statement excoriating Liberman, calling him a “weak” Defense Minister and demanding he adopt tougher policies to end the wave of “kite terror” from Gaza. “Liberman is a weak, confused, Defense Minister,” the statement read.